13. 08. 2007 | Press conference of FK Mladá Boleslav took place in Holiday Inn Hotel of the Prague Congress Centre v Prague-Pankrác on Thursday, August 2, 2007 at 11.00 a.m. The representatives of the club presented the latest football news from Mladá Boleslav club. Šeterle said that the club managed the last season with the budged of CZK 165 million when a third of this budget was turnover associated with participation of FK Mladá Boleslav in European cups. The budget for the next season 2007/08 will be identical. The journalists also learned that FK Mladá Boleslav was using a new logo that acknowledges more than one hundred years long history of football in Mladá Boleslav and simultaneously also honours the colours of the last five successful years. 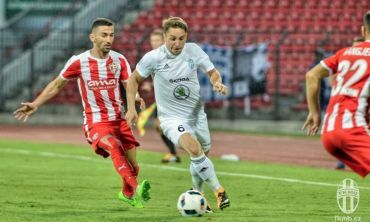 Thirty-year old brisk full-back Marián Palát transferred from FK Mladá Boleslav in Russian FK Luč-Energija Vladivostok that is ranked thirteenth in the current sixteen-team Russian top league. The former goalkeeper of Liberec Marek Čech has been in the club since this winter. Marián Palát has agreed upon a three-year long contract with the management of the club from Vladivostok. And so when his hitherto playmates returned by bus from a training camp in Austria, Palát packed his belongings and football baggage and flew away far east. In the dawn of Monday, July 11, the entire football team of FK Mlada Boleslav left for Köflach in South Austria. The team are going to spend 8 days on the location; their main target of this preparation training camp is the team's in-game performance. Coach Zajíc nominated three goalkeepers and twenty field players for the event. The squad are planning to undergo training sessions every day, and three preparation matches. The first duel is scheduled for Saturday, July 14, with the Bundesliga Champion, VfB Stuttgart. By midday Monday, June 11, 2007, the management of the football teams FK Mlada Boleslav and AC Sparta Prague have concluded the negotiations on the transfer of Martin Abraham from Mlada Boleslav to Sparta and a six-month visit of Petr Voříšek to Mlada Boleslav. Both parties have commented the talks as "complex, yet correct". Voříšek is going to arrive to the Boleslav squad at their training camp in Köflach, Austria, while Abraham is scheduled to join the Sparta, who are now on a camp in Austria as well. FK Mladá Boleslav will be strengthened by twenty-five years old Tomáš Hrdlička from Slavia Prague. His signed a four-year contract to the club from Mladá Boleslav on Wednesday, 27 June 2007 in the evening. He started his career in Slavia Prague where he has appeared in 107 first-league matches during six seasons since 2001 and scored ten times in these matches. He played twelve matches for the U21 Czech national team and scored once. Offensive force of Mladá Boleslav will be improved by the well-built forward Ivo Táborský. He was a regular player of Slavia Prague so far, but he played as a guest player in Dynamo České Budějovice during the last season and sweated the defenders of Mladá Boleslav properly in the shirt of Dynamo both in autumn 2006 and in this spring. In order to prevent him in doing so also during 2007/08 season, Mladá Boleslav offered him a contract and Ivo Táborský signed it for the next four years. He will start preparation together with the team headed by Luděk Zajíc on Saturday, June 23, 2007. The king of league strikers Luboš Pecka obtained the prestigious Josef Masopust Award for offensive activity in the last 2006/07 season of Gambrinus League. The players collect points for this individual competition for goals scored from play (2 points), from penalty kicks (1.5 point) and for final passes (1 point). Luboš Pecka, the player of FK Mladá Boleslav, overcame the opponent goalkeepers fifteen times from play and once from a penalty kick and, moreover, the statisticians registered one his goal pass. Luděk Zajíc will not be any rookie in the first league. He worked as Uhrin's and Molnár's coach-assistant in Sparta Prague and Slovácko respectively and he also held the position of the head-coach in Hradec Králové in 1995 and together with Bokša in Mladá Boleslav in autumn 2004. He knows both the environment and players in Mladá Boleslav and has not prepared any principal changes. However, as the head of scouting, he has selected some new players as defending of the positions of Mladá Boleslav in Gambrinus League and in the UEFA Cup will be very demanding task. According to the International Federation of Football Historians and Statisticians, Spanish Sevilla FC is the current best football club of the planet while FK Mladá is the second best Czech club on the 84th position of the world ranking. The fresh Czech Champion, AC Sparta Prague, is ranked twenty positions higher. These facts result from assessment for the period between June 1, 2006 and May 31, 2007. According to a prestigious ranking of the Sport daily, the skipper of Mladá Boleslav Marek Matějovský was crowned on the throne of the King of Football Pitches while his two team-mates, the goalkeeper Miroslav Miller and midfielder Martin Abraham accompany him on the imaginary winners' steps. Moreover, the stopper Jan Rajnoch and the forward Luboš Pecka from the team of Mladá Boleslav are also ranked in the Best Eleven of the 2006/07 league season. Another forward of Mladá Boleslav Jan Kysela is also ranked in the top ten of the best individuals.